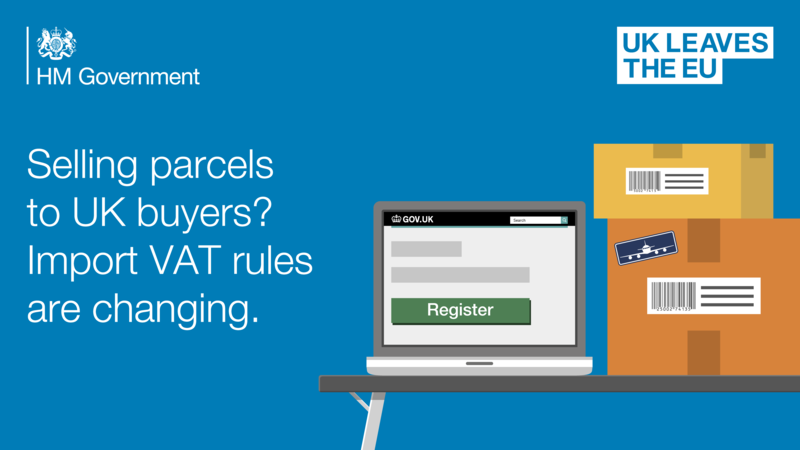 Materials to help stakeholders inform their customers about changes to the rules for reporting and paying import VAT on parcels for sellers outside the UK if we leave the EU without a deal. If the UK leaves the EU without a deal, there will be changes to the rules for reporting and paying import VAT for sellers outside the UK. This toolkit provides an overview of the changes, and includes resources to share with your members, clients or customers to help them get ready for the changes. The materials in this toolkit have been shared directly with a wide group of stakeholders, and are published here for information and for further use by stakeholders. The toolkit does not contain any information that is new or hasn’t already been published elsewhere. Read full guidance on the changes. Sellers outside the UK can use a new online service to report and pay import VAT on goods they sell to UK buyers. Text which can be used on your social media channels. A short news story style article providing details of changes for sellers from outside the UK, that can be used in newsletters or other communications. A summary of the important changes in liability, and information on registering for the digital service that you can use to communicate with your members, clients or customers.